Artist and former Talking Heads frontman David Byrne is a paragon New Yorker – smart, cool, artistic, and attractive in a slightly wacky way. He also rides his bike everywhere. And, most importantly, he’s always thinking, and doing, and creating. Tonight he opens Tight Spot an installation under the Highline, near the Pace Gallery‘s other West 25th Street locations. The installation is the inaugural exhibition for the gallery’s recently acquired space, which was formerly a vacant, outdoor garage. 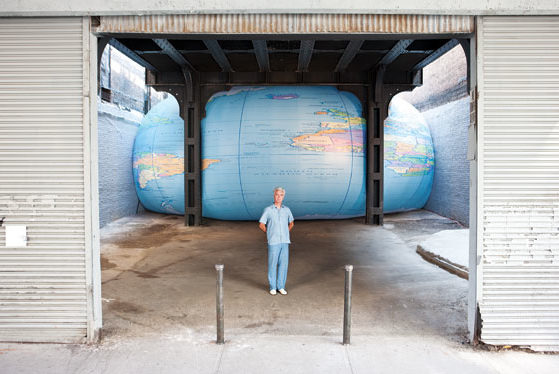 A visual essay on the vulnerability of the world, Tight Spot consists of a 48-by-20-foot inflatable globe, much like the ones referenced by elementary school students, squeezed into the outdoor exhibition space. Inside the globe are speakers emanating a soft yet discernable oscillation, a processed noise that Byrne created with his voice. “[Using my voice] was the easiest and fastest way of creating the sound I was hearing in my head,” explains the artist. Combining sight and sound, Byrne has created an existential work that captures the senses and attracts visitors to explore his world. Tight Spot runs through October 1, 2011.